Antiplagiarism - program will check if your diploma thesis is not a plagiarism. The Antiplagiarism software detects a possibility of commiting plagiarism with the highest efficiency among solutions available on the market. 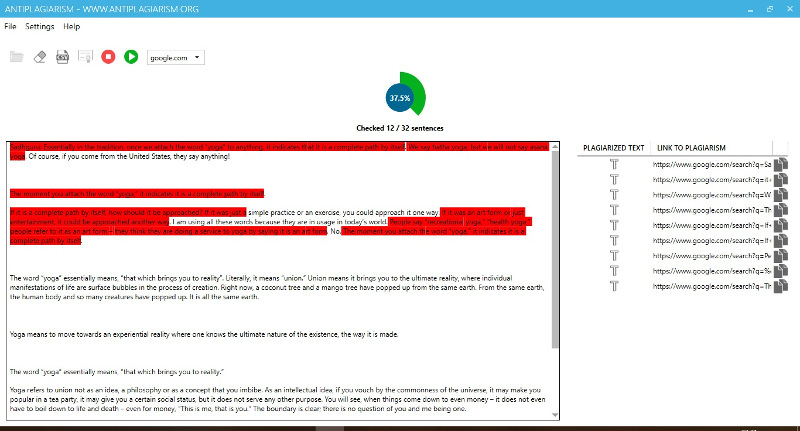 A professional system analyzes text for plagiarism. Sophisticated algorithm automatically compares fragments of your thesis with Google search results. After completing the analysis process, the program indicates places in the text which can be treated as plagiarism of someone's text. Each such a fragment is highlighted in red color and the user can display web pages on which the analyzed fragment was published. Reliable - the program copes well with both extensive diploma theses as well as short textes like an article or an essay. Support for PDF format - our program is one of the few that supports PDF format, so you will not be forced to convert your thesis to another format. Do not waste time and nerves on programs that only deal with plain text files. Support for format of Word program - antiplagiarism supports files with the DOCX extension, which is the format used in Microsoft Word, that is part of the Microsoft Office suite. Advanced search - fragments of your thesis will be compared with the results of the Google web search engine. Antiplagiarism app will search the websites with cheat sheets, essays, etc. Security - by using our software you have guaranteed 100% of security - your texts will never leak to the internet. No third party has access to your thesis. Unlike online applications, the program does not upload files to any servers, everything is done locally on your computer. Various language versions - the Antiplagiarism is entirely in the English and Polish language versions. Technical support - we offer full technical support.